After I came back from college, I’ve had a lot of different things I wanted to change to my bedroom. But of course that meant a lot of money is needed and I’m a broke college graduate. 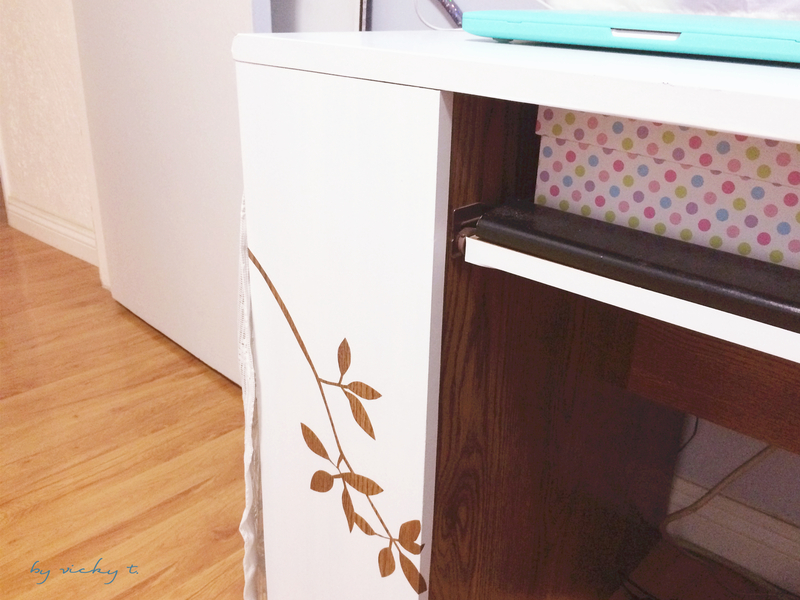 Here’s some of super simple DIY hacks that I’ve done so far to ease the pain haha. My old desk was one of the things I wanted to get rid of when I returned home. I’ve had it since middle school and the fake wood covering was peeling off. 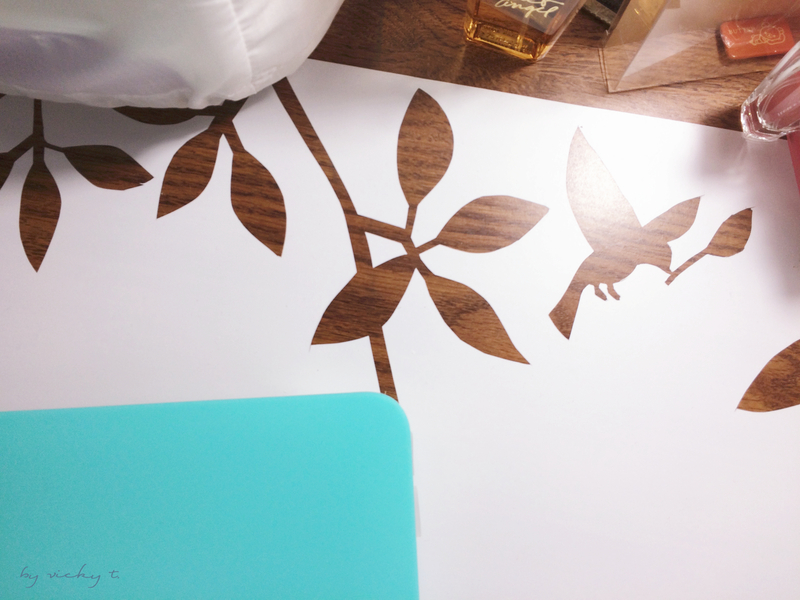 The table itself was perfectly fine though so I bought some white contact paper, drew some branches and leaves, then covered the entire table with it but leaving some of the “wood” showing. 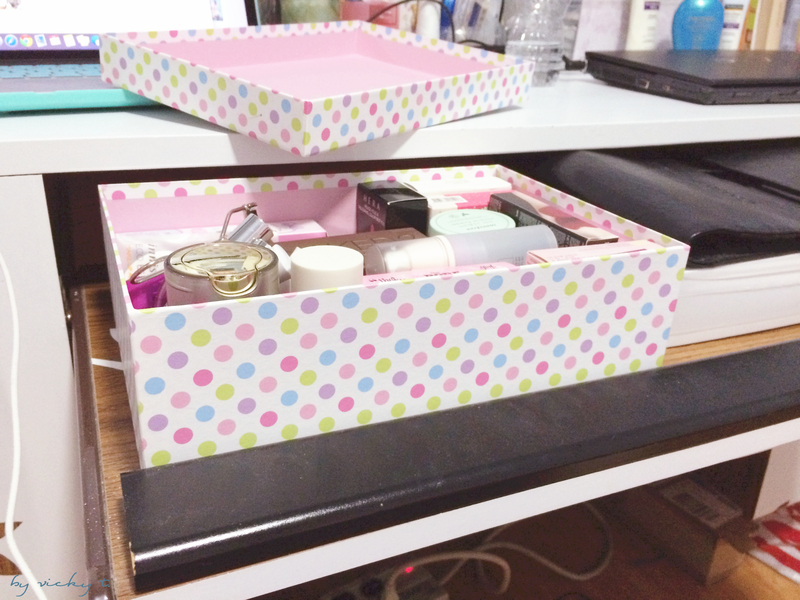 The desk is mainly a computer desk but I only use a laptop now so I used the keyboard area to place all my makeup stuff. Makeup gets too dusty if it was left there; I placed all of them in a box and shoved it in this compartment. 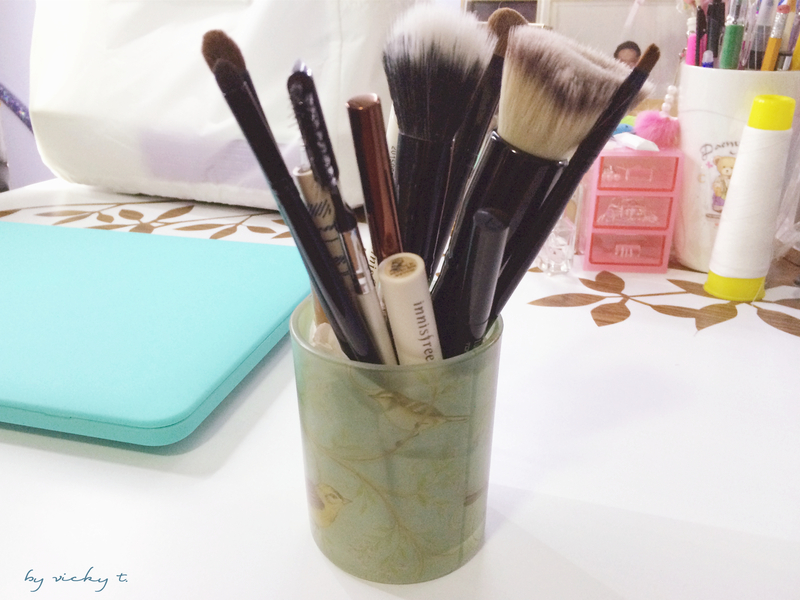 Speaking of makeup, I simply grabbed a pretty cup I got as a gift and placed all my makeup brushes there for easy access. 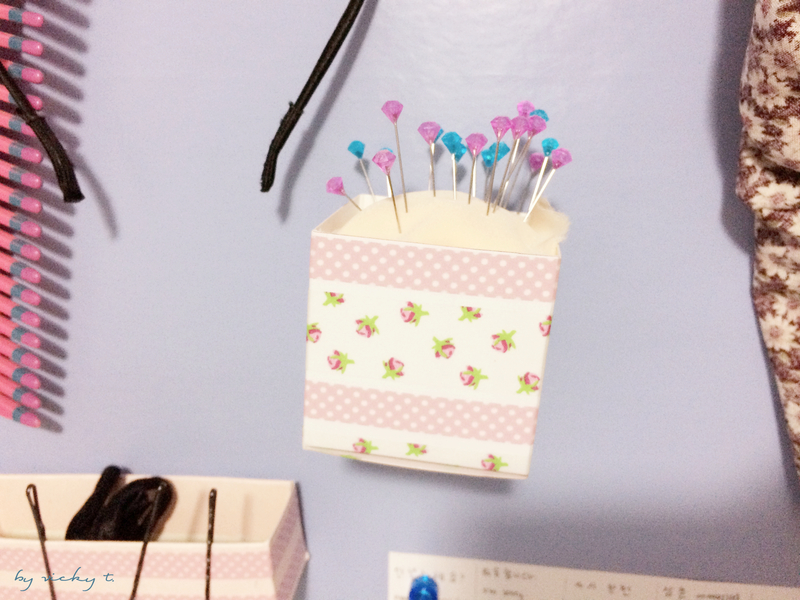 I previously made a magnetic board to hold my miscellaneous objects such as bobby pins. Since the pin cushion which I featured in a different post had no place to stay, I glued magnets to the back and stuck it onto the board too. Other than the magnetic board and posters, my wall is pretty empty so I made my own decals with the contact paper I used for the table. 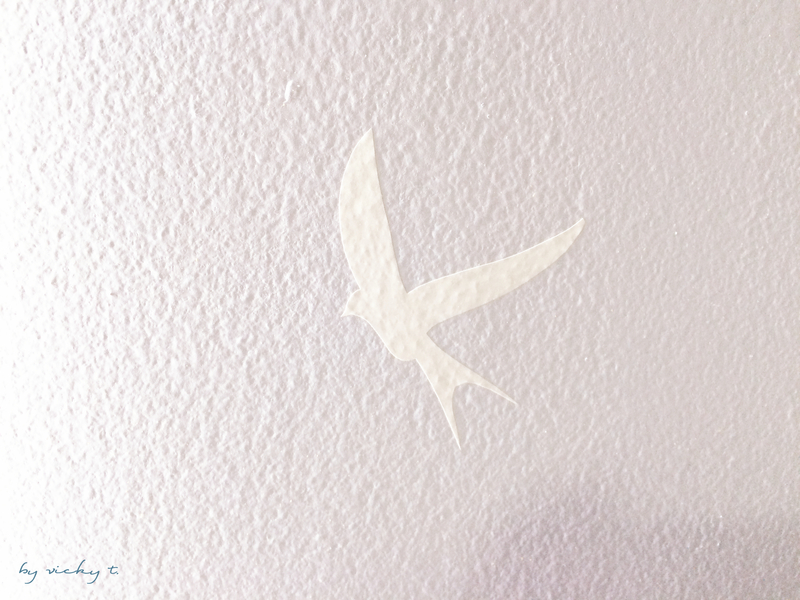 I traced this particular bird from an image online and just cut and paste onto the wall. The latest addition to my room were these plastic hooks I bought on amazon. They have adhesive on the back and was easily installed onto the walls. I had a lot of clothes that no longer had a place to hang so these hooks came in handy. They could surprisingly accommodate quite a few pieces of clothing. Hope you liked my hacks! I’ve had my desk since I was 7! Lol I don’t think any diy can help restore it though, it’s all scratched up and old-fashioned. I’ll probably have to search for a new one! These are such great hacks! thanks for sharing!